Incompatible chemicals give an undesired chemical reaction when mixed. This usually refers to substances that will react to cause an imminent threat to health and safety through an explosion, fire, and/or formation of toxic materials. The term can also refer to an unwanted change in the physical or mechanical properties of the materials. Compatibility extends to fire extinguishers as well. Class D flammable metal fires are incompatible with water as well as carbon dioxide fire extinguishers. A special unit like this one available at Safety Emporium is required. Even everyday chemicals have incompatibilities. For example, did you ever notice that containers of bleach have a warning not to mix bleach and ammonia? When mixed, these substances generate the toxic gases chloramine (NH2Cl) and hydrazine (N2H4), which could cause serious injuries or death! Other examples of incompatibilities include the reaction of alkali metals such as sodium or potassium metal with water. In this case, the products are extremely basic sodium or potassium hydroxide (corrosive), hydrogen gas (explosive) and a lot of heat (an exothermic reaction). The heat generated is so great that the hydrogen generated will usually ignite! See our entry on water reactive chemicals for information on the proper storage of these materials. Improper storage and disposal of incompatible chemicals has led to a number of accidents. Always properly identify and segregate your chemicals and wastes to avoid the accidental mixing of incompatibles. For example, do not store acids and bases in the same cabinet. Do not store acid waste and organic waste in the same area. See the links under Further Reading for more tips and information. "Wiley Guide to Chemical Incompatibilities", Paperback, 1,110 pages, 2009. Estimated price: $140.00. Info and/or order. "Field Guide to Clandestine Laboratory Identification and Investigation", Plastic Comb, 144 pages, 1997. Estimated price: $89.94. Info and/or order. "Rapid Guide to Chemical Incompatibilities", Paperback, 866 pages, 1997. Estimated price: $72.65. Info and/or order. Fortunately, chemical incompatibility is one of the items that OSHA requires on an MSDS. Read your MSDS carefully and make sure the labels on the container include warnings about incompatibilities. If the label lacks such warnings, why not add them? Most mistakes with chemicals happen not when they are being used properly, but when a process or reaction is being cleaned up. This is when most people tend to let their guards down and when a variety of different kinds of chemical substances can be mixed. If some of these are incompatible, look out! Here's one example of what can happen in these kinds of situations. Note the lessons learned and safety tips that accompany this article. 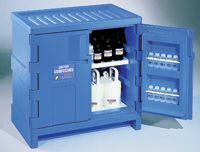 Get your corrosion-resistant polyethylene acid storage cabinets with internal sumps from Safety Emporium. The Chemical Safety Library (free registration required) available at http://www.pistoiaalliance.org/projects/chemical-safety-library/ contains over 75,000 reagents and is "dedicated to sharing previously inaccessible hazardous reaction information in the interest of increased laboratory and personal safety across the chemical industries". It is a terrific resource for checking that one is not accidentally mixing incompatible materials during laboratory or chemical mixing operations. Practical Segregation of Incompatible Reagents in the Organic Chemistry Laboratory, a proposed system for incompatible chemical reagent segregation. A handy list of incompatible chemicals (print and save) at the U of KY.
Chemical Segregation at Purdue University. Chemical Storage Guidelines at Lawrence Berkeley National Lab. EPA compatibility chart (PDF file) thanks to Harvard University. Chemical Storage Plan For Laboratories at the Medical College of Georgia. Chemical Compatibility/Resistance Database at Cole-Parmer lists how well certain materials stand up to various chemicals. Very useful. General Chemical Storage Compatibility Chart at the National Institutes of Health. See also: decomposition, water reactive. Entry last updated: Wednesday, March 15, 2017. This page is copyright 2000-2019 by ILPI. Unauthorized duplication or posting on other web sites is expressly prohibited. Send suggestions, comments, and new entry desires (include the URL if applicable) to us by email.